Alice Lucille McLeod Coltrane was born in <?xml:namespace prefix = st1 ns = "urn:schemas-microsoft-com:office:smarttags" />Detroit, Michigan to Solon and Anne McLeod. Her half-brother Ernie Farrow was a noted bass player who recorded with Yusef Lateef and Terry Gibbs. Alice began seriously studying piano at age seven and subsequently continued her music studies throughout high school and beyond. Her advanced studies included the music of Rachmaninoff, Beethoven, Stravinsky and Tchaikovsky. 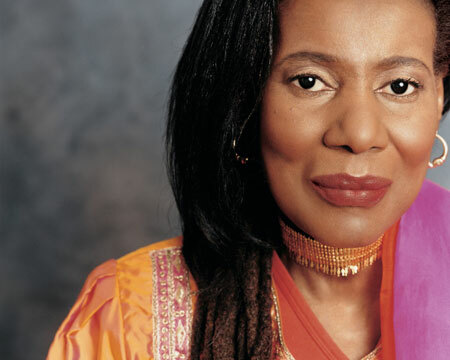 Of the difference between classical music and jazz, the path she chose to take, Alice Coltrane said, "The classical artist must respectfully recreate the composer’s meaning. Although, with jazz music, you are allowed to develop your own creativity, improvisation and expression. This greatly inspires me." Alice studied at the Detroit Institute of Technology. In her early twenties she lived in Paris where she studied with pianist Bud Powell. While in Paris she was briefly married to singer Kenny “Pancho” Hagood and they had a daughter together, Michelle. She returned to Detroit and around 1962 moved to New York, where she met John Coltrane a year or so later. At that time she was the pianist in the Terry Gibbs band. Alice and John Coltrane were married in 1965. They had three sons: John Jr., who died in a 1982 automobile accident; Ravi, who is a jazz saxophonist and recording artist, and Oran, who plays alto saxophone. In 1966, Alice Coltrane became the regular pianist in John Coltrane’s band after the departure of McCoy Tyner. Alice would later appear as a harpist on Tyner’s album Expansions. In 1967 Coltrane died and Alice took a vow of celibacy and began her solo career as a recording artist. After recording over ten albums for Impulse and Warner Bros records, Alice Coltrane withdrew from commercial recording and devoted herself to her spiritual work and to managing the musical legacy of John Coltrane. Alice Coltrane on stage with her sons, Ravi and Oran. In 1970, she studied under Swami Satchidananda and later under Sathya Sai Baba. She founded the Vedanta Center in San Francisco and later moved the ashram to Agoura Hills, outside of Los Angeles. For retired from the music industry for twenty-eight years but returned in 2004 with Translinear Light, a recording produced Ravi Coltrane. Sacred Language of Ascension, a new recording is forthcoming shortly. Instead of being known mainly as John Coltrane’s wife, if Alice Coltrane had been a man, she would have been celebrated as one of the true visionaries of 20th century music. As the widow of Trane, many of us assume some of Coltrane simply rubbed off on her and that her music was reductively a branch of the John Coltrane baobab. As a female, one of only a numerically small group of instrumentalists in jazz, her work is often overlooked or dismissed as spiritual "new age" noodling. Yet when her work is examined and compared to her contemporaries, the musical evidence demonstrates that the breadth of her work is phenomenal. I have chosen to write about four tracks but could easily have chosen eight or twelve others of equal merit. She started as a Bud Powell/bebop disciple and then became Trane’s chosen helpmate in the last period of Coltrane’s recording career. The third incarnation of Alice Coltrane was as a solo recording artist. The fourth period was as a private spiritual musician. The fifth and final period was a return to jazz concerts and recordings. The opening track is “Journey in Satchidananda,” a classic cut from a classic album. This is the album on which Alice Coltrane successfully manages to extend the John Coltrane musical legacy and simultaneously mark out her own directions. I choose this track specifically for the harp playing. The line up is Alice Coltrane on harp, Pharoah Sanders on sax, Cecil McBee on bass, Rashied Ali on drums, and Majid Shabazz on bells and tambourine. “Turiya And Ramakrishna” is an example of Alice Coltrane’s deep piano work. I love the way Alice plays piano. Love how she merges intelligence with emotion. How she acquired the ability to play “out” and simultaneously sound “in” (i.e. accessible). Her Detroit, Michigan childhood church background is foregrounded in how she voices her chords. It is interesting to note that Alice does fascinating chord alterations on piano, while on organ she takes a more harp/Bud Powell-like approach with the rippling arpeggios. Notice also the dynamics of her touch, a soft note played next to a more percussive struck note, the tremolos in the block chords, the rubato flow of her improvisations. Her playing moves with the grace of a massive current assaying a fifty-degree bend in the river. This track is from another classic Alice Coltrane jazz combo album, Ptah, The El-Daoud. Alice’s supporting bandmates are Pharoah Sanders and Joe Henderson on saxophones and flutes, Ron Carter on bass and Ben Riley on drums. I fell out laughing when I first heard “Ghana Nila.” This is some negroidal music. It would take one of us to merge black church music with Hindu spiritual songs/chants. I bet both devote Christians and devote Hindus are probably a little taken aback by this unicorn of sound. Alice is on organ and electric piano (the organ/piano duo is a mainstay of black church instrumentation), lining out the song like an old-time choir master. Check the ending with the voices stretching out. “Bliss: The Eternal Now” and “Bliss: The Eternal Now – Return” are actually remixes from Carlos Santana’s Divine Light: Reconstruction & Mix Translation: Bill Laswell, an album that combines and remixes selections from two Santana albums, Illumination, which featured Alice Coltrane, and a second album that featured English guitarist John “Mahavishnu” McLaughlin. I listen to this remix album more than anything else by Santana. This is a slight musical introduction to the vast body of Alice Coltrane’s music. Asante sana. Thank you very much. For your music. Your spiritual life. The good and beauty you created. Asante sana. For those interested in knowing more I recommend that you visit Alice Coltrane’s official website. Also check out Zoilus, this website offers links to Alice Coltrane write-ups on the web some of which include mp3 recordings. Divine music is one of the highest mercies extended to us by God. It is as powerful as prayer itself. The potency of sacred music has in certain instances superceded the curative properties of medicine, mantra, and affirmations. This is due to the heart’s principle of love, purity, and innate receptivity. Often, the mind that knows the use of recitation and affirmations, at times has found that little value results when it exhaustedly abandons the constant repetition. Divine music is a curative virtue; it is a gift from God that brings healing and comfort to the soul. This music can uplift one’s spirit up to a higher dimension of being that is filled with peace and joy. Divine music is the sound of true life, wisdom, and bliss. This music transcends geographical boundaries, language barriers, age factors; and whether educated or uneducated, it reaches deep into the heart and soul, sacred and holy, like an Infinite sound of glory entering the Lord’s sanctuary.